snips snippets: WIP Wednesday - the quicky edition. Not a lot on the go today, i've had a monster headache for the last couple days and being hunched over my machine hasn't been helping any. But i did manage to get another one of my bee blocks done. This one's for Peggy who asked for Christmas blocks in a style of our choice, but referred to this block as one that she liked. My Christmas colours are not really the norm and i'm hoping that she likes it! I really enjoyed making this block and i will definitely be making it again! And i think i know what fabric will be my starting points for the fussy cuts... hoping to show you all soon, it's in the mail! The progress on these is painstakingly slow, but i'm enjoying it! I picked up the Square Dance panel in blue and the larger squares are perfect for 12 inch blocks. I'm thinking i might pair the smaller squares with squares of hexies to make a 12 inch four patch block... did that make sense? Anyway, i'm hoping to make a bit more progress with this one, i'm probably delusional, but i'd like to be doing the hand quilting on this one this fall. It's okay... you can laugh, i'm trying hard not to! Getting my link on with Lee and Kelly this week!! High fives for having my bee blocks finished through September! Love the Christmas block, with the non-traditional colors. Beautiful! Your hexies are lovely! When I see some I always feel like I must do some hexie project myself, lol. Love the little reindeer. 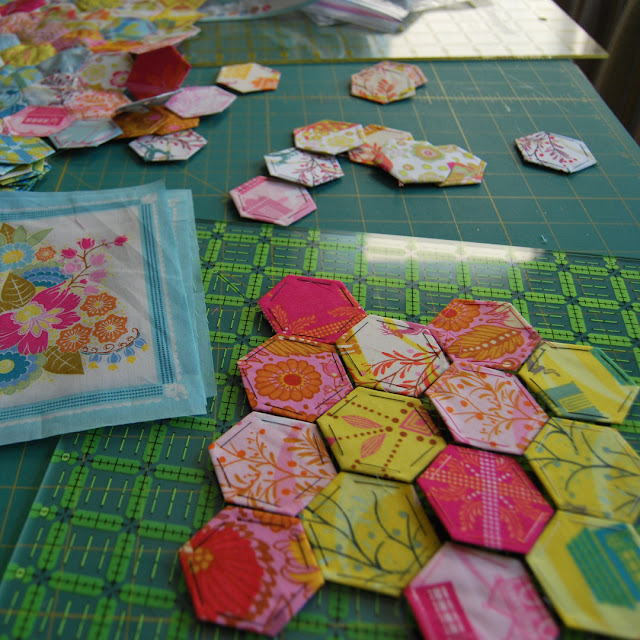 Those AMH hexies are scrummy! That reindeer is so stinking cute! I heart him. Perfect size, perfect cut! Way to go on getting all your bee blocks done through Sept! It's so nice to cross thing off the list :) I am loving your AMH hexies. I hope you feel better. Really cute Christmas improv. The colors are nontraditional- and awesome! I'm sure she will love it! Thanks so much for sharing at Needle and Thread Thursday and I hope you're feeling much better!